Car Repair Spreadsheet – Why Didn’t I Think of This Earlier? I recently got nailed with a $1500 car repair bill. The big ticket item was replacing an EGR Valve. Now I know very little about cars and tend to tune out when mechanics start getting technical, so I didn’t recognize that this was the third time that I had to have my EGR Valve replaced in the last 3 years. Now I keep meticulous records on my beloved VW Golf TDI, which I’ve named Silver Surfer. By meticulous records, I mean that I have this bulging folder with every receipt going all the way back to September 2001 when I bought the car. Even knowing nothing about cars, I should have caught that the same part was being replaced 3 times in such a short period. Something else was causing the part to fail. My thick folder of receipts from six different mechanics across two states was too cumbersome to be useful. So today I spent a few hours doing what I should have done years ago. I created a spreadsheet for every service call done to my car. I created it using the spreadsheet option on Google Drive, which is free. After I created my auto spreadsheet, I chatted with my mechanic about Google Drive. Then I shared the sheet with them. Now he can see the what work has been done, when it was done and who did it. That is another diagnostic tool they can use the next time my car needs to be serviced. And because they know I’m tracking every action, they will be less likely to inflate the service requirements. Even the act of creating this spreadsheet has made me more knowledgeable about cars. I was forced to look up a few items to increase my understanding before entering the data. I can now start intelligently being proactive about the needs of my car and not just blindly trusting the mechanic. 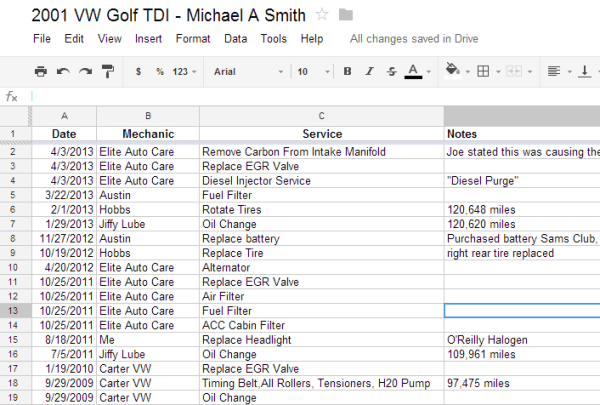 If you drive a car, I highly recommend that you create a quick spreadsheet for your car. You could save thousands. I would have. @Kate – I was able to enter 11.5 years of data in about 3 hours. Going forward, this spreadsheet should only take minutes to update. Considering how much time we waste in the lobby of mechanics – we have the time. Are you really only changing the oil every 10 K miles or 2 years?? @Mike – Yes. It is a diesel. You only driving 5K miles in a year? @gman – In Seattle that is about right. When I lived in San Diego, I was closer to 20,000/yr. I used to have these issues with my 13 year old Civic. Now I have a three year lease. All I do is buy gas and put oil in a few times a year, then give the car back at the end. A bit more costly, but zero time thinking about maintenance, and zero stress about the next breakdown (Ever lose a muffler on the way to a job interview?). And I don’t even know if it is really more costly–at the end of my 13 year run with the Civic, I was getting hit with random $800 repairs every six months or so. How about a page for recalls and TSBs? All in all, fantastic idea. I just bought a new VW GTI. Not diesel. Love it. @Mike: The “every 3,000 miles” recommendation gets lots of criticism for being a suggestion based on company profits as opposed to actual need. You’ll see this notion argued passionately on a million car forums. From what I’ve read, I think a range of 5-10k is more reasonable. But this varies with vehicle type, age, condition, oil type, etc. In other words, a lot of factors. With new VWs, VW does your oil changes for free…at 10k miles. The conspiracy theorists point out that VW used to recommend oil changes much more frequently, but changed their tune to 10k when they started offering this benefit to new buyers. NPR ran a great radio show for decades called Car Talk. The guys still maintain their site and have great car advice for the average person. cartalk.com. @Brian – 2 of items are listed as “campaigns”. Those are what VW called the 2 recalls I am aware for my car. I sent you a link to recalls.gov for your vehicle. Shows 8 recalls. Not saying they all directly apply to you, but worth verifying. Btw, TSBs are great to know about as a vehicle owner because many mechanics either forget to look for them, or aren’t updated on them immediately. One of the few things that may be worth actually printing. @Brian – Good stuff. I just noticed I paid for one of those repairs out of pocket. I doubt I have recourse since it has been so long. I’m going to go through this tomorrow. Thanks! I liked your idea so much that I copied it. But I added a field for price paid so that I can compute the trailing cost per mile of purchase + maintenance. Having been hanging around the mrmoneymustache site forums they recommend 8 cents per mile as the goal, and they include insurance in that too. thanks for the idea, and cost/mile might be useful to track as well. @rbiser – I considered adding $$ to the spreadsheet, but I think that would have made me too sad. Going forward I will be much more proactive. I even got a Auto for Dummies book to read. Something I should have done many years ago. @MAS – Do you recommend the dummy brand of books? I assume you looked at a few different volumes before picking the one that you did. @rbiser – I found a car site that listed the 5 best books to start learning and the Dummies book made #3 and it was in my library. I’m about 30 pages into it and like it a lot so far. There is a section on diesel engines, which was important to me. I think learning a little about cars may help a lot. Part of my laziness with respect to the spreadsheets is that I usually have some idea what’s going on with my car. I’m mechanically inclined and typically investigate before purchasing major repairs. May I also suggest a Haynes or Chilton guide? One is available for your make/model. They typically have detailed parts break downs, instructions for simple repair and maintenance, and troubleshooting guides. I would consider one invaluable in an older car. My current car has few maintenance issues, but the last car demanded I use a guide fairly frequently. @Kate – If I can make it through the Dummies book and am still interested, I will absolutely get a Haynes or Chilton guide. A few years ago I never would even attempted to learn about cars, but oddly it has been my success in learning cooking that has given me the confidence to try autos. If you get the Haynes and the Chilton and you’re still thirsty, look for a “factory service manual” for your car. It’s what the dealers used before everything went online for them. I have a ’12 VW and unfortunately they don’t use a paper manual at VW anymore. I bought that Dummies guide, I hope you got a kickback as I am a 6’4″ ectomorph who has sponged off your essays on training for a while. I would say thanks for not having ads on your site but since I run AdBlock I don’t know if you have ads on your site or not. Although having second thoughts I think I should also point out that while ectomorph etc. is a nice shorthand I think if it is taken as anything more than shorthand the somatype thing is bunk. A better conceptual model is a phase space with dimensions representing propensity towards muscle growth, propensity towards fat storage, height (frame length), stockiness (frame cross sectional area), fast vs slow twitch etc. etc. etc. And recognize that this is all a continuum. @rbiser – Yeah, I don’t ads on CriticalMAS. Thanks for the Amazon click-thru purchase. I’m up to page 250. I never thought I’d be fascinated by auto info, but I’m getting into it. As for somatypes, I agree it is a continuum and not everyone will line up, but it is a good starting point. I am an ectomorph. Many of my posts are geared toward the ectomorph, because I think most fitness professionals don’t get us. They provide advice that often keeps us from reaching us muscular potential. I’ll be posting more on that soon. This spreadsheet idea is fantastic. I love it so I am going to use it within my own business. I will place a link on my website to here so that my customers can use this to track my work against others. @Mobile – I was fortunate to live one building away from a mobile mechanic. He saved me money the two times I used him. Good guy.